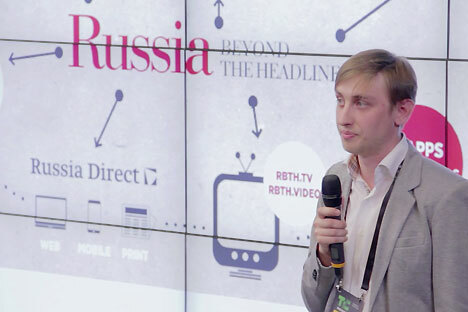 Moscow conference showcased some of Russia's most promising start-ups. TechCrunch Moscow 2013 was held in the Digital October center on Dec. 8 and 9. In addition to the hosts, Mike Butcher (TechCrunch Europe), Ingrid Landen (TechCrunch) and Edward Shenderovich (Kite Ventures), more than 50 performers from Russia, Europe and the U.S., as well as hundreds entrepreneurs, venture investors, representatives of major IT-companies and journalists attended the conference. “At TechCrunch Moscow 2013 we decided to return to the roots of innovations and focus on their main task – improving the quality and efficiency of everyday life processes,” organizers said. An updated list of the top Russian startups for the current year was finally announced on TechCrunch Moscow in 2013. Organizers of RSR, GreenfieldProject and Digital October Center, are paying special attention to young businesses in the high-tech field, so the TOP-50 list includes 25 projects from high-tech, biotech and medicine, as well as 25 startups in IT and Internet. This differentiates the current rating from the previous ones with a focus on the high-tech breakthrough developments. "Within six months since the release of the previous TOP-50, we significantly improved the assessment methodology," said Renat Garipov, the general director of GreenfieldProject. "In this issue, we decided to rely on high-tech startups, which are still neglected by venture capital investors. We hope that the rating will be a good guide for professional market participants and readers abroad. We have issued the rating for one and half years in six languages, and we see that this information is in great demand among foreigners," said Dan Pototsky, the executive editor of special projects with RBTH. The list is really impressive: startups from the fields of medicine, new materials development, klintech. Despite the fact that half of the list is represented by companies operating in the IT field and e-commerce, the rating can be called exclusive, a truly “detoxifying element” in all TechCrunch in which the rate was made on high technology based on what many Russian reviewers pointed out. The entire first day was devoted to startups, and all the startups were eager to get into the media. Startup performers were at the stands, ran through the corridors, pitched their ideas on the stage and tried to get the attention of potential investors and journalists. This year’s startup Dreamroomer won the first place in the Startup Battle, winning tickets to the spring event of TechCrunch in New York City. Startup Medesk won second place and also got tickets to New York’s conference. This year saw a large prevalence of startups of finance, e-commerce or usual trade, development of applications and interesting devices. There were a lot of B2B and SaaS projects. What is TechCrunch without the market maestros? Experts like Sergey Fage of Ostrovok.ru talked about the new phenomenon called “growth hacking.” Adeo Ressi, the founder of TheFunded.com and The Founder Institute, talked about the differences between the Valley and other places in terms of business dealing. Participants from Moscow was not disappointed with the last statement. Considering the fact that the Russian developers out number developers from other countries in in Israel the statement of Ressi did not surprise anyone. Inessa Ishunkina presented the latest statistics of the Russian Internet, which showed that 76 million Russian users in October were used social networks 50 minutes a day; Smart TV and mobile internet audience is growing very fast; major advertisers are Renault, Nissan, Volkswagen and Megafon; and the most popular websites are Yandex, Mail.ru and Vkontakte. Leonid Volkov and Ekaterina Patyulina, members of the electoral opposition camp of Alexey Navalny, said they considered their campaign as a startup, talking about the special projects and general atmosphere in the team, as well as the volunteers motivation. The appearance of Brad Fitzpatrick, the creator of LiveJournal made a certain furor. He admitted that he didn’t watch LJ and didn’t know what was happening to him now, and what will happen in the future. The last time he tried to log in, LJ found his account suspicious.